Please note Phase 1 of Kimberley to Cape finished 30 June 2016. It’s hoped there will be a Phase 2 in the near future. Please email Shar Molloy at shar.molloy@ecnt.org if you can assist or if you have questions about Kimberley to Cape. 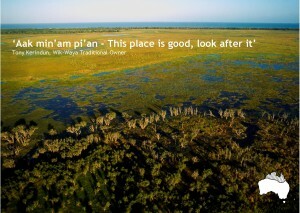 We believe in a successful future for Northern Australia, do you? The unique, multiple and globally important values and resources of the Northern Australian savanna are safeguarded into the future through appropriate development and conservation. To support development and conservation that embraces natural and cultural values, and strengthens communities, from the Kimberley to Cape York. Kimberley to Cape is working to serve and support organisations across the North to ensure a sustainable and prosperous future for all of us. We are facilitating informed conversations and agreement on what this future might look like, and starting to align effort, investment and action around this shared vision. We are working in the coordination, policy and communications space to support local people on country and identify and promote the benefits of a healthy and intact savanna. We don’t aspire to become an umbrella or ‘top down’ entity, but rather a grass roots led change agent.